Charity Guild of Johns Creek, Inc. 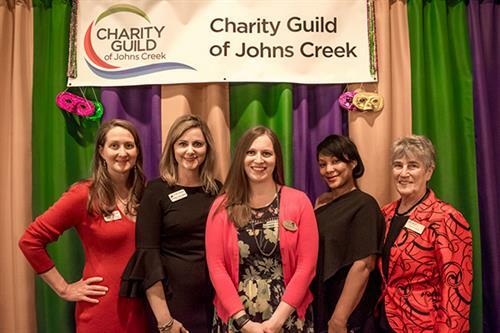 Through fundraising and outreach, the 140 + members of Charity Guild of Johns Creek provide on-going assistance to each of our 6 local named charities. CGJC hosts fundraising events as our primary source of funding and has contributed over $1,000,000 in goods and services to benefit our friends and neighbors in need over the course of our 25 year history. Additionally, several ''Thanks a Million'' spot grants may be awarded annually to local charities and organizations nominated by members, sponsors, partners and the community at large. Annual Service Projects include assembling TLC Kits for CHRIS 180 children, Easter baskets for kids in STAR House programs, coat & food drives for NFCC and holiday gift cards for Senior Services North Fulton. CGJC hosts the annual Holiday Arts & Crafts Expo at St Ives Country Club and partners with North Fulton Community Charities Holiday Assistance program to sponsor a community-wide Toy Drive for their Santa Shop. A signature spring event, Wine Tasting, Tennis Pro-Member, golf tournaments and more round out the list of projects and events requiring volunteers, sponsors and attendees. Join Charity Guild of Johns Creek today and be a part of something big!